Major Paul Trickett will be leading a bible study entitled: Before Amen by Max Lucado. 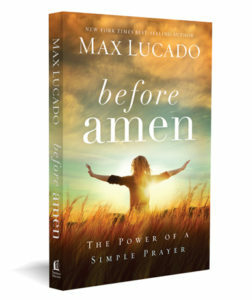 It is a family christian book for very good reason – it’s an excellent, light read that really gets you thinking about your prayer life. Lucado reaffirms what the scripture says about prayer and how we are to cast all of our cares on God through those prayers with relatable stories in his own life. Every Wednesday at 6pm starting February 6th for 4 weeks.